Years ago, on a Sunday late in March I went to Kingston Markets in Canberra, to hang out with friends, purchase speciality foods, buy a few books. It’s not usually a market for bric-á-brac, but on this occasion there was some, and in pride of place, out in the bright sun I found one of my bowls (photo 1), with a label inside: ‘made by Richard Raffan—$75’. In those days a raw burl that size—420 x 100mm would sell for at least that and probably more. This bowl is dated 1985 and would have retailed originally for about $250. I would have received just over half of that of which the burl would have accounted for about $30, maybe $20. This bowl is one of a number of thick and heavy bowls I turned when writing about how to make use of second-rate timber for my book Turned Bowl Design (Taunton Press1987). I never enjoyed making chunky burl bowls, especially with natural edges, but I was grateful enough when these sold readily to foreign tourists. Assuming the price would be negotiable, I offered $50 for my bowl. We settled two seconds later at $60 and as I paid for the bowl I was told what a bargain it was because the maker is very famous. I confessed and said I’d be re-turning it. 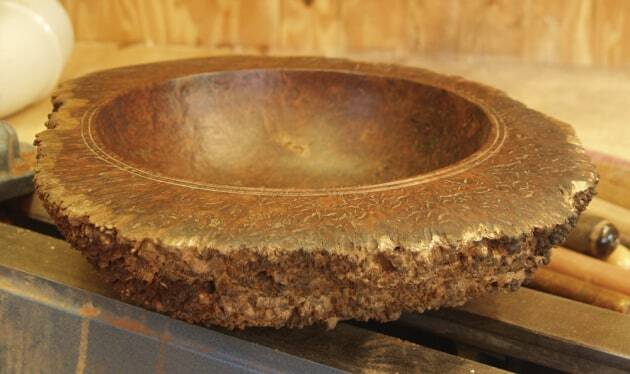 This bowl was made at a time when thick forms were still something of a rarity and the interest in burls was just emerging. 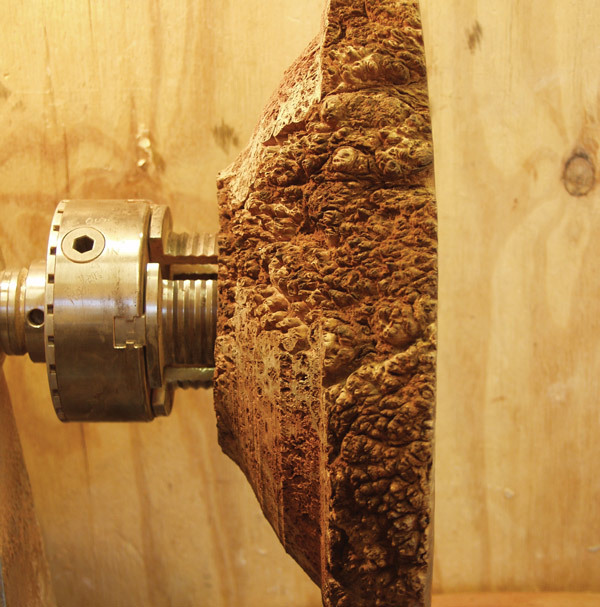 Most burls were severely degraded having been initially cast aside by loggers who were after sawlogs and unaware of, or not interested in, the growing craft market or woodturning as a hobby. At the sales end in galleries, great lumps of burl masquerading as lathe-art were selling regardless of form or function provided they were vaguely shiny. With my eye on a quick profit, I wondered briefly if I should simply polish up the bowl and offer it to a few collectors and museums who might like it in their collections as an historical curiosity. Then as I oiled a patch of rim, I realised that I really don’t wish to be remembered for such bowls and decided to put it back on the lathe for a make-over, thinking to change the profile whilst retaining the top and inside. Remounting this bowl on the lathe was easy as there was a dovetailed rebate in the foot for a long extinct chuck. Now I used the expanding Vicmarc Shark Jaws (photo 2) and removed the lower bulk. It was very tempting to turn away the spiky natural edge as well, but this would have reduced the diameter by nearly 20%—along with the price that is inevitably dictated by the maximum dimensions. And there are those who like a spiky natural edge, so it made commercial sense to retain it here. The burl was dry in 1985 when I turned it initially; and it was not a wood to be turned thin then, let alone 21 years later. Any rim would need to be thickish, and the final spiky edge would look better if uniform in thickness (photo 3). As would be expected after a few years, the wood had moved a bit. The surface had collapsed to a cross between old leather and the skin of a navel orange; the beads around the rim were distorted, which was fine. However the rim was distorted, so in order to get an even edge I needed to true up the top (photo 4). Clearly the original beads would have to go. As a rule I try to avoid straight lines in my designs, so the new rim has a slight asymmetric curve and is tilted out. The whole bowl could have been finished on the one fixing, but I wanted to re-turn the base, partly to true it up, and partly to remove the chucking rebate. convenient corner into which to expand the chuck; visually it also defines the working space of the bowl. You need smooth dovetail jaws for this, and, if the corner into which they locate is cleanly cut, any bruising on the wood is very difficult to see, even when you know what you’re looking for. I count myself lucky to have had the chance to make this bowl into a better object, although still not one I’d want to be remembered for. For years I’ve wondered when all those rather ill-considered bowls woodturners have been churning out over the past 20 years would start being recycled and re-turned: so many are little better than rough turned bowls set aside to season. My advice is to keep an eye on the junk and opportunity shops as those pricing the goods seldom realise what wooden bowls are really worth. Or maybe they do. First published in Australian Wood Review magazine, issue 51.